US workers have voted against union representation at a Volkswagen car plant in the southern state of Tennessee. The vote derails efforts by the United Auto Workers (UAW) to organize foreign-owned factories in the southern US. Experts had expected the ballot to pass in favor of unionizing, after Volkswagen tacitly supported the move. The vote had faced resistance from Republican politicians, who argued it would slow economic growth. 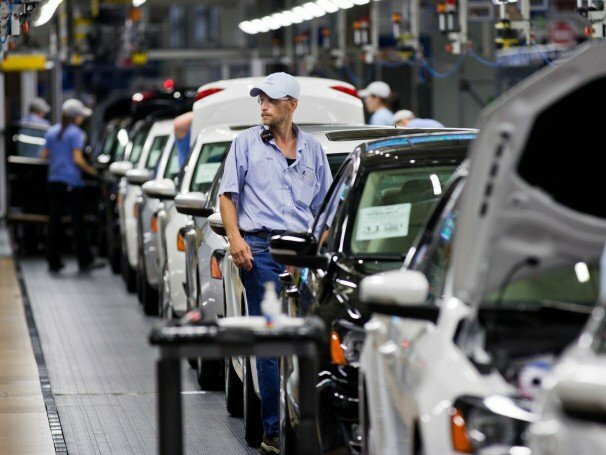 It was the UAW’s first attempt in 13 years to unionize a plant not run by one of the three big US carmakers – General Motors, Ford, and Chrysler. Analysts say the result could significantly curtail future organization efforts and further dent the union’s reputation. Membership is reported to have plummeted 75% since the late 1970s, leaving it with barely 400,000 supporters. Some 1,550 workers began voting at the plant in Chattanooga on Wednesday and rejected the union plan by 712 to 626 with an 89% turnout. UAW spokesman Gary Casteel said “some outside influence” had been exerted on the poll. Some believe the loss will make it harder for the UAW to recruit members at other southern plants. The push for organization started after Volkswagen opened its only US facility in Chattanooga in 2010. The manufacturer’s 61 other plants around the world have so-called “work councils”, which represent employees’ interests in daily dealings with management. Mandated by law in Germany and popular in other European countries, works councils have never been tried in a US factory. Conservative groups had leaded a fierce anti-union campaign in the lead-up to the ballot. Opponents warned it would jeopardize Volkswagen’s tax incentives and hurt the local economy by scaring away business. Is Kim Kardashian pregnant again?